Virginia Tech had to endure a halftime buzzer beater as well as a late Notre Dame comeback, but they still managed to hold on and pick up a big road win over the Fighting Irish 80-75 in South Bend on Saturday night. The Hokies improved to 15-6 overall and 4-4 in the ACC with the win, while Notre Dame dropped to 13-8 and 3-5. The Irish went into Saturday night’s game without their two best players, power forward Bonzie Colson and point guard Matt Farrell. And for most of the game, that’s how they played. The Hokies would have taken a 10-point lead into the halftime intermission were it not for a halfcourt buzzer beating three-pointer, and Tech went on to lead by as many as 15 points in the second half. In fact, Notre Dame led for just 1:43 of the 40 minutes played. This was a game that Tech controlled for the most part, though they had to survive a late Notre Dame run to hang on. Virginia Tech led by 15 points, 62-47, when Justin Bibbs nailed a three-pointer with 11:27 remaining. That’s when Notre Dame began to chip away at Virginia Tech’s lead, and their comeback was aided by Kerry Blackshear being in foul trouble yet again. He fouled out with 4:16 remaining, with the Hokies holding a slim 70-68 lead, and things looked grim for the visitors. However, Notre Dame was never able to take the lead or even tie the game. Chris Clarke took over down the stretch, scoring 10 of Tech’s last 12 points, including six straight points over the final 23 seconds of the game. His biggest stretch came from the 51 second mark to the 23 second mark. First Clarke pulled down a rebound on the defensive end, and though he missed a close shot on the offensive end, he tipped in his own miss, giving the Hokies a 76-72 lead. The Irish then missed two shots, and Clarke pulled down the defensive rebound. He was fouled, and his two free throw extended the lead to 78-72. Justin Robinson got a steal on Notre Dame’s ensuing possession, pitched it ahead to Clarke, who finished with a dunk to make it 80-72 Hokies with seven seconds remaining. Notre Dame nailed a deep last-second three-pointer, but it didn’t matter. The Hokies walked out of South Bend with a big road win. Clarke was quiet offensively for most of the night, but he came through when it mattered. He finished with 12 points, 14 rebounds (a career high in ACC play) and four assists. Justin Bibbs added 20 points and five assists. He was 8-of-10 from the field, and 4-of-4 from three-point range. Bibbs made his first eight field goals. Justin Robinson extended his streak of good play with 12 points, seven assists, and no turnovers, while Nickeil Alexander-Walker added 11 points and was 3-of-6 from the outside. Virginia Tech had a fantastic shooting night, going 29-of-57 (50.9%) from the field, 14-of-25 (56%) from three-point range, and 8-of-10 (80%) from the free throw line. They had 19 assists and only 10 turnovers. Meanwhile, Notre Dame shot just 39.3% from the field and turned the ball over 13 times. Their 15 offensive rebounds and 18 second chance points kept them in the game, but on the whole the Hokies controlled most of the action. Virginia Tech returns to action on Wednesday night, when they go on the road again to face Boston College. Tipoff is scheduled for 9pm, and the game will be televised regionally by RSN. Check your local listings, and click here for a list of networks that will be showing the game. 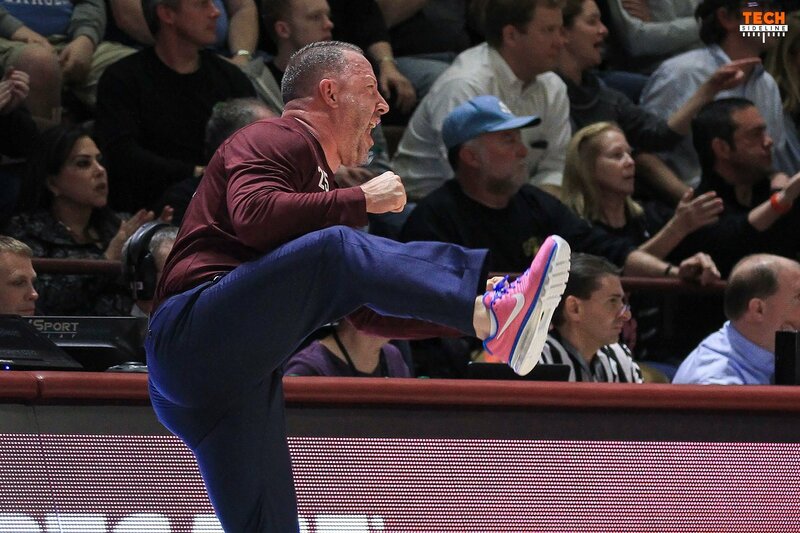 Ivan’s shot of Coach Buzz is a classic. Thanks, Ivan for the beautiful work. Clarke may have been “silent” offensively for much of the game but, when he was in the lineup, Tech’s offense ran through him. He was at the top of the circle for much of the game finding cutters to the basket or guys open for 3 point shots. He spurred several fast break baskets with some impressive passing. He was able to provide some very nice defense against ND’s bigs while KB was on the bench. He was a rebounding hog, and scored when the team needed him to. Seems to me this was one of his most valuable games as a Hokie. We don’t win if Clarke has an “average” game. Beating UNCheat and ND in the same week is pretty sweet in any year, any sport – especially MBB! Chris Clarke has been my favorite player and he showed Why last night. Hokie heart & soul! Great road win against a weaker ND team (no coleman or farrell) – Hokies doing what they should if we going to get to NCAA’s! I’m liking the less turnovers and more KJ minutes – and seeing some leadership coming to the front – clarke, robinson, bibbs, hill –> two of these four need to lead every night! Way to go…Chris Clarke…stepping up! Thanks …Chris Coleman…for posting overnight. Those Chrises will get after ya!